just as a matter of interest, is this the normandy? Would say yes, it is the Normandy. 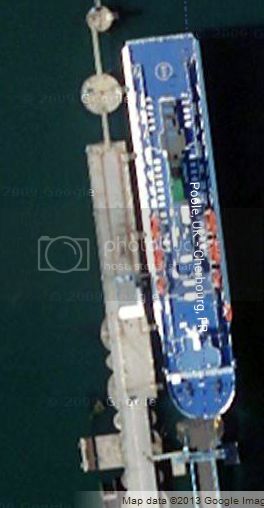 I assume that was taken in Cherbourg from Google maps, it is the Normandy for definite. 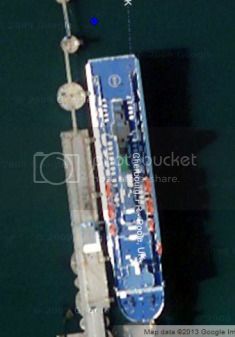 It has to be the Normandy - Oscar Wilde is currently on passage to Brest ETA 16:00 UTC - presumably for bow door repairs. Just back home from an overnight drive from London via Pembroke. First time on the Inishmore since 2001 and first time driving rather than flying home! Passenger areas still look factory fresh despite now pushing 16 yrs old. Not the biggest fan of rough seas so was fearing the worst. Despite the winds, there was only slight pitching for most of the crossing which was impressive and loads of room to spread out to catch some sleep. All in all job well done by IF. Thumbs up to the crew for navigating a gusty arrival at Rosslare too. In terms of load,deck 5 was full roughly half and half with cars and hauliers, not sure how full deck 3 was or whether the load included the Fishguard customers. Another view of the Normandy on google maps, this time from Singapore, nearer the end here at Sembawang shipyard. Anyone know why Ulysses didn't leave her berth tonight 2055 sailing to holyhead ?? 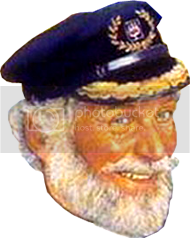 stena adventurer was lateat leaving im presuming to get irish ferries traffic onto stena ? Shes leaving her berth now at 2150 ! her speed is 0.4kts so i guess shes leaving ! Wonder what the delay was though? Medical incident onboard caused the delay. Yeahh ! Just heard today as my dad was getting the next sailing from holyhead 0240 and it left holyhead late .. he said that it was delayed in dublin because a passenger broke his leg and the ship needed a doctor and ambulance ! Another sat shot of the Normandy hanging out in Cherbourg during happier times. were the stena europe and the normandy sisters?